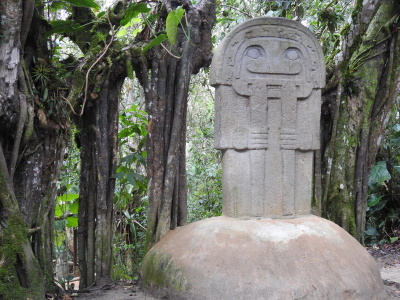 San Agustín Archaeological Park is a pre-Columbian archaeological site containing the largest collection of megalithic sculptures on the continent. They were constructed during the Agustinian Culture, which flowered from the 1st century AD. I often say "getting there is half the fun". The inscribed site is in 3 parts. I visited the two most important, the Archaeological Park and the Alto de los Idolos. I found the whole visit extremely enjoyable. San Agustin is an attractive laid-back little town with friendly helpful people. The lush green mountain scenery is gorgeous. I stayed at Residencias Menezu and would recommend it highly. I learned something of the way of life (and death) of a civilisation of which I had previously known nothing. Some of the works which were undertaken, like slicing the top off 2 small hills and filling in the intervening valley, to create a level area, were quite remarkable. In addition to the tombs and statuary, at Fuente de Lavapatas, a huge flat stone carved with all kinds of images intersected by channels through which water trickled, I saw something unlike anything I have seen elsewhere. Man-made Terraces: "huge monumental platforms, terraces and mounds"